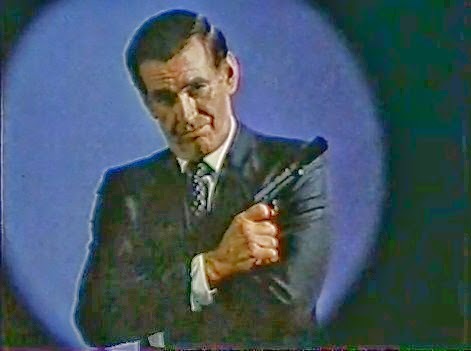 Rod Taylor from the main titles of the Masquerade television series. Friday, Aug. 18, is Rod Taylor day on TCM’s Summer Under the Stars. And some of Taylor’s spy movies will be part of the proceedings. As an aside, TCM’s programming day starts at 6 a.m. New York time. The spy movies start early. Sorry for the late notice, but the Spy Commander just found out himself. 6 a.m.: 36 Hours, World War II espionage movie. Germans kidnap an American officer (James Garner). They make him think World War II is over to trick him out of information about the invasion of Europe. Taylor plays the German performing the deception. Based on a story by Roald Dahl. 8 a.m.: The Liquidator. Rod Taylor as John Gardner’s Boysie Oakes. Music by Lalo Schifrin and a title song performed by Shirley Bassey. 10 a.m.: The Glass Bottom Boat, a Doris Day comedy involving spies seeking secrets from a Tony Stark-like character played by Taylor. Cameo by Robert Vaughn as Napoleon Solo.